These St Patricks Day activities were started by our family's favorite teacher. Mrs. Corcoran who was not only Irish but born on St. Patrick's Day! This St. Patrick's day scavenger hunt was inspired by Shamus, the leprachaun's annual annual classroom visit ! Here's how you can do it at HOME! Let the kids search for some fun St. Patrick's day accessories that will get them into the spirit of the day. It’s a great St Patrick's day game for home, a birthday party, scouts, class moms and teachers! Let's get started by making their Leprachaun finders! These Leprachaun finders are so easy to make.. use empty toilet paper or paper towel rolls, with a rubberband secure green cellophane over the top.. When they peer through the end, they can still see, but of course, everything is in green! We made them the day before. On St. Patricks day morning or perhaps a few days before, the kids come downstairs to find lots of things askew in the different rooms. When they want to know what is going on.. introduce them to Shamus with this cute free printable! and write a note that you read to them advising that Shamus slid down off his rainbow in search of his gold coins! He needs their help to find them. Next, take a look at our free printable with the clues to find the pot of gold! For the first clue you could hide these sparkling Elf Shoes, Green, . This St Patrick's Day Pot-O-Gold Cauldron with 50 coins is the perfect end for this fun game! This St. Patrick's Day Dress up Set from Amazon includes Shamrock Beads Necklace's, Tattoos, Shamrock Shutter Glasses, Head Bopper, & Acrylic Irish Print Gloves . You can get all your goodies in one box! This is such a great story and is a perfect addition to this St. Patrick's Day activity for the kids. The Leprechaun Trap: A Family Tradition For Saint Patrick's Day is a great addition to the family library! Add Shamus the leprachaun and you can create a fun family St Patrick's Day tradition of trapping the leprachaun! Here is a full package complete with printables so you can implement these St. Patricks Day activities right in your classroom. Take a look at all that is included in this kit for only $2.49! There are more fun St Patricks day activities here! 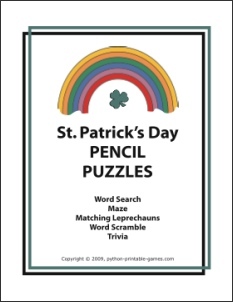 Here's some fun printable St Patricks Day games, perfect for classroom fun! Free Lucky Leprachaun Bingo game here!